If you want to explore the complex landscape of gene interactions, Cytoscape makes for an excellent compass. Developed by a consortium funded by the National Institute of General Medical Sciences (NIGMS) of the NIH and the NSF, Cytoscape is an open-source software platform to visualize and analyze complex networks such as biological pathways and molecular interactions. A unique feature of Cytoscape is that it not only allows one to visualize networks, but it also permits the integration of those networks with annotations and other data such as gene-expression profiles. The introduction page provides an excellent overview of Cytoscape’s features including its visualization capabilities, analysis features, and even its multilingual compatibility. 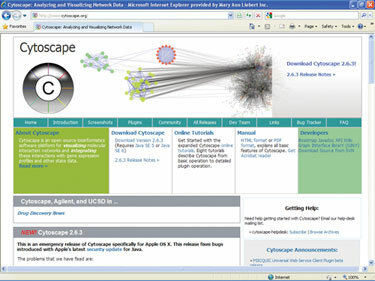 In addition to the actual Cytoscape download, the site also gives a number of links to other software downloads, data-exchange formats, and network databases.